Play Brown Dust and manage and lead your own mercenary army to battle! Be immersed in the game’s awesome story and lore, as you take part in tactical battles. Recruit new mercenaries to your corps and be the strongest company in the land! First off, Brown Dust does a good job in telling you the game’s lore. The cutscenes and images placed to depict the world’s history is outstandingly-made, adding to the immersion aspect. 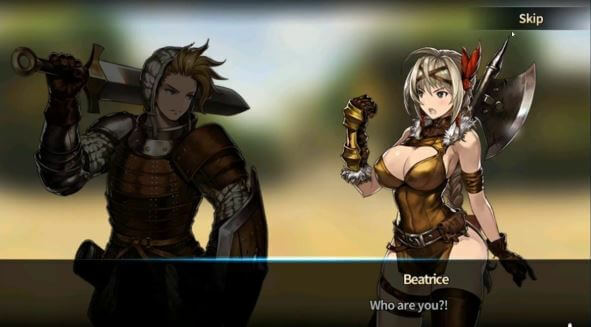 Once you have gone past the opening cutscene, you will be choosing your character’s name (you won’t be able to pick his face, equipment, etc), and go straight to the tutorial. The game does a good job in orienting you about the basics, from deploying units to summoning new ones to add to the fray. In spite of the intuitive menus and careful explanation of the gameplay elements, the game has a steep learning curve which you need to hurdle. Brown Dust’s battle system is automatic, and your participation is limited to deploying your units. Though this may feel dull, every unit you place, their respective positions, abilities, as well as those of your enemies vary, making each match a strategic puzzle you need to crack. In every battle, there are three lanes wherein you can place several units. Your soldiers and enemies first attack enemies on their opposite lanes and once that is done, they will proceed to other lanes. In Brown Dust, there are also different types of unit classes, each with their own abilities. For example, a defender with a huge shield is best suited in the front line, guarding your ranged units and catapult units. However, it is ill-equipped to defend against berserkers who deal bonus damage to it. Spear users can attack two adjacent units, while an undead bomber can deal huge AoE damage but can only attack once and has low HP. It is imperative you need to take advantage of unit strengths and weaknesses prior to deployment. Brown Dust is generous in giving you characters to fiddle around with in the campaign, and before you know it, your roster gradually starts to fill up with seasoned soldiers. However, you will need to level them up so they can deal with bigger battles ahead, and you can do this on the menu by merging them together or using slimes to increase their levels. 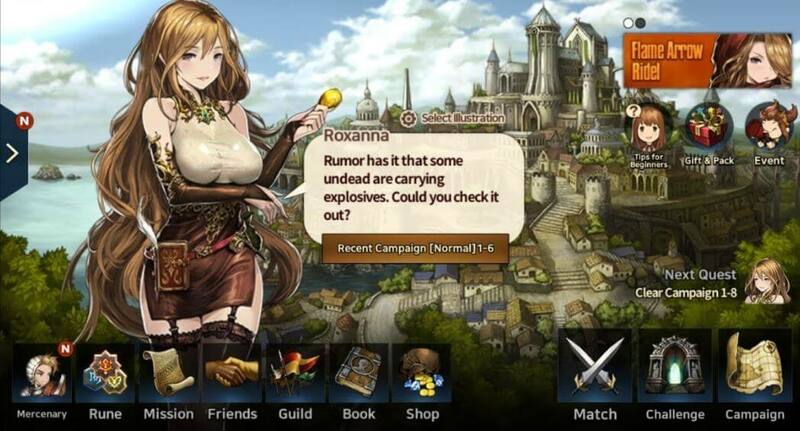 The mercenary-summoning element is basically similar to a gacha mechanic, and you need to use the game’s premium currency. Unfortunately, the need to purchase microtransactions gets dire as the game progresses due to the difficulty of the campaigns and the PvP modes. The game isn’t free-to-win, but you have to spend enough cash if you want an easier time. Brown Dust’s anime art style is pleasant to the eyes, though we have to say that the fanservice stand out a lot. The environments, especially during cutscenes and the battles, are also as detailed. The characters themselves fall into cliche tropes: there’s an honorable lieutenant, a freakishly strong yet insecure lady, and a seductive yet morally upright tavern lady. Nevertheless, the writing is superb, and the character interactions can leave you laughing out loud. There are also little to zero localization which is rare in games made in East Asia. NEOWIZ, the game’s publishers, are based in Korea, and they did fantastic job in this regard. Overall, Brown Dust may be your typical hero-collecting game, but it’s one of the well-made ones in the market. With an engrossing story and dynamic cast of characters, it provides an immersive experience and is something you don’t want to miss out on. Even if the battles are automatic, the deployment aspect has numerous tactical implications that strategy gamers would find enjoyable. So, give it a shot and start making a name for yourself!